I’m an Okie from Shawnee and I enjoy your Oklahoma Modern blog. I’m taking a photo trip/family visit to Tulsa in mid-April and want to check with you about what’s still around for me to enjoy. Go to an actual church service in the Boston Avenue Methodist Church to see the interior. 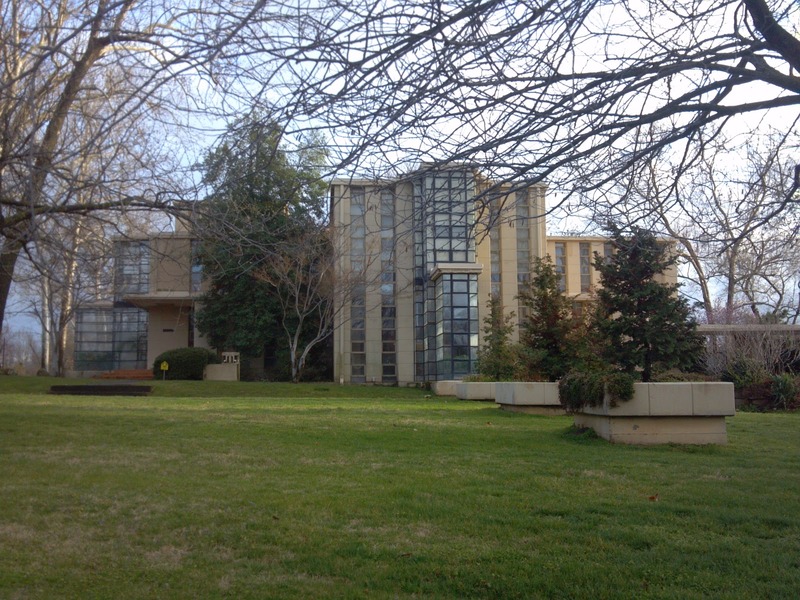 Look for the Frank Lloyd Wright designed residence in Tulsa – Do you know the address? Find more Bruce Goff stuff in Tulsa. If there isn’t any, drive to Bartlesville to see the what’s available there. Walk around Oral Roberts campus. I’ve got 2-3 days to relax, take pictures and reconnect with the area. The Frankoma House is no longer open for tours. But the house is now part of a trust, and the ultimate plan is to make it and the contents into a museum. Boston Avenue United Methodist Church offers tours after services every Sunday. Tours during the week can also be arranged. For more info check the church's website (and note the lack of any mention of the name Bruce Goff). Lortondale is one of the largest contiguous neighborhoods of Mid-Century Modern homes in the nation. You can easily locate it and other cool Tulsa neighborhoods on a Google map maintained by Modern Tulsa. Frank Lloyd Wright for his cousin. Westhope is the Frank Lloyd Wright residence built in 1929 for his cousin Richard Lloyd Jones. It's located at 3700 S. Birmingham (near 36th and Lewis). 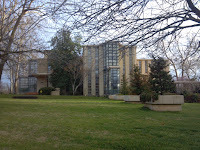 A journal listing all of Goff's works in Oklahoma is published by the Friends of Kebyar (and it does include Boston Avenue Methodist). Copies are available online or at the gift shop in the Price Tower Arts Center, along with other Goffobilia. ORU... yes! Stroll around the campus at sunset and bask in the warm glow of the metal of the future- anodized aluminum! The iconic Prayer Tower has recently been partially restored, and visitors are welcome. For a special treat take a drive through the neighborhood just east of the campus. Up on the hill overlooking ORU you can see the former home of Frank Wallace, the man who designed Oral Roberts University. My favorite Goff building in Tulsa is the teensy house he designed for Adah Robinson. It's located behind Tracy Park at 11th Place and South Owasso Avenue. If you drive by Westhope take a tour around the neighborhood. Just west a few doors is one of Tulsa's oldest homes. It was originally the Perryman family hunting cabin and dates back to the early 20th century. Just east of Westhope are also a couple great modern houses. Through May 6, 2012 you can enjoy a wonderful exhibit at the Price Tower Arts Center. It's called Greta Magnusson Grossman: A Car and Some Shorts and features an impressive display of this lady's excellent work. If you have a suggestion feel free to post a comment below! And if you have a question feel free to contact us! McCune and McCune's Autobank and Senter's Service Pipeline Buidling, both at 6th and Cincinnati, provide a neat study in the transition from Art Deco to Mid-Century Modern. Jones House: 1916 E. 47th St. Though it's not Mid-Century, the Greenwood District is definitely worth walking through, as the little plaques in the sidewalks say which businesses and establishments were lost and/or rebuilt after the 1921 race riot. It's just a really neat window into Tulsa's complex past. Copies of the Bruce Goff Oklahoma Guide are available through the Friends of Kebyar for $20.00. The price does include postage. We can get it in the mail to you quickly, please let us know when place your order. The 48 page journal includes maps, photographs and description of all of Goff's extant buildings in Oklahoma. However, now the Bavinger house has been demolished. Thanks, Rex and Jackie! I covered a lot of uncharted ground thanks to you!